I have shown in my previous post Writing a “Resistor Code” App for Blackberry Playbook that it is quite easy to design apps for Playbook. 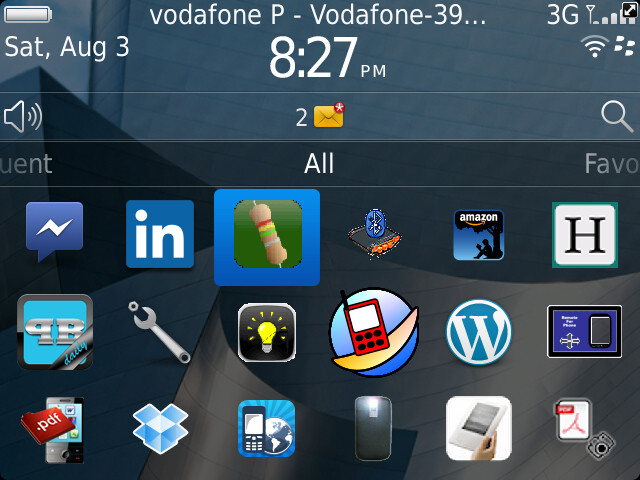 That said, it is quite easy also to design apps for Blackberry smartphones, with recourse to Blackberry WebWorks. The creating of Blackberry packages is done with not many external requirements. However, you need to use external tools in order to generate signing and debugging assets required to put deployments onto device. When you are registered you will receive code-signing keys. You will receive 3 csi extension files with words like RBB, RCR and RRT. Copy then all to the folder you have created for keys. We suggested to be “BB” as the paragraph before last says. If you know how to deal with DOS (check in previous paragraph Wikipedia’s link to learn about DOS commands) you can get there step by step. I advise you at this juncture revise DOS commands. Press Yes button in next popup write your password. Take note of this password, and keep it safe. You will require this password in next steps, and in the future. The same type of popup will invite you to write your PIN and password as you did before. Repeat the same procedure with RRT csi file. If you have done all the signings and got reassuring popup windows telling you that you have registered and have also received email from websigner at Blackberry that you have successfully registered your keys you are ready to compile your App. In order not to reinvent the wheel, you will accept my zipped file “rescolbb.zip” which you can download from Bitbucket, an unlimited free private repositories’ site. Unzip the contents of zipped file. You will need an unzipper program perhaps. And now view the webpage (use Google’s Chrome as you will need it next). We are going to use the web app in the file to make our Playbook App. We will next compile our zipped file (you just downloaded). If you have made any modifications to extracted files you will need to create a zipped file, that is if you want to implement your modded webpage. If you wonder why we took the trouble of signing our App is that otherwise our App will not work once installed in our Blackberry with an error like “Error starting AppName Module ‘AppName’ attempts to access a secure API”. I assume you have Blackberry Desktop Software installed in your PC. You will need to connect your smartphone to your PC with an USB cable. You will need StandardInstall where your COD and ALX files are. You have to be patient and waith for your Blackberry to re-initiate. It may take a while. If you have reached this stage of the tutorial with success, congratulations! That is it. 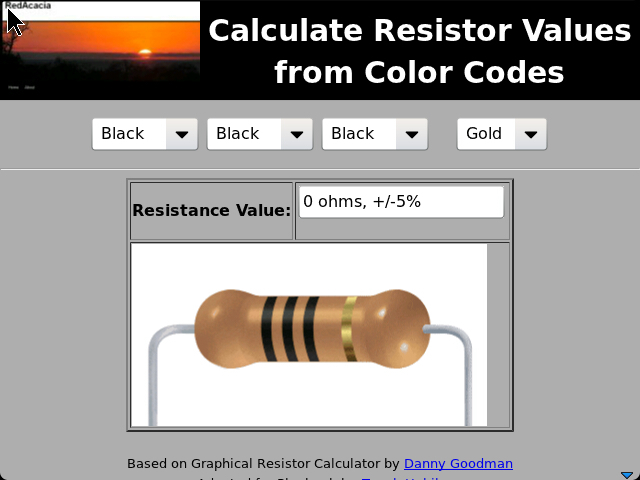 You can tweak the color bands of the resistor and see the corresponding values. Credits are due to Blackberry for providing so much valuable and free information on the Web. A special thank you is also due to Danny Goodman for his “Graphical Resistance Calculator” web application which has served to design our App. Once more I thank Bitbucket for providing me a free of charge repository from where rescolbb.zip can be downloaded. This entry was posted in Mobile Apps, Programming and tagged App, BlackBerry, Java, Resistance, Resistor Code, Web Works SDK, WebWorks. Bookmark the permalink.